Continuing the ongoing series of interviews with creative artists working on various aspects of movie and TV productions, it is my pleasure to welcome Stuart Bentley. In this interview he talks about the evolution of cameras and lights at his disposal, the changing landscape of the art of storytelling, collaborating on set and working on episodic television. 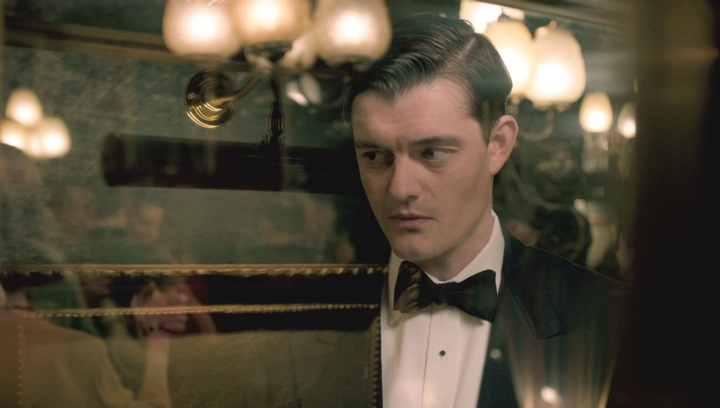 The second half of the interview is about Stuart’s work on the recently released “SS-GB”, a five-part BBC drama mini-series set in a 1941 alternative timeline in which Nazi Germany occupies the United Kingdom. When I was around twelve or thirteen I got massively into skateboarding. After a few years, me and my friends started taking photos and filming each other, and it became something that we did every day. That was all happening while at school I was becoming more interested in art and photography. We had a small dark room in our school where I was doing my stills. Then I went to art college, I did a fine art degree where I did a lot of painting, filming, and all kinds of other disciplines. All through that time I was still very much into skateboarding, and as some of my friends were becoming really good at it, I started to film a bit more seriously. We would travel all over the place, getting paid here and there and making our own skate videos. So I did that when I was younger, day to day, we would be out there all day every day, rain or shine. At the same time I was studying art and photography. I was shooting, editing and directing short films with my friends, and the more I did that, the more I realized that I liked filmmaking. It wasn’t necessarily just about skateboarding filmmaking, but rather the whole process of it. That’s when I started to veer off the skateboarding path, and got into doing music videos and commercials. Eventually I moved to London and went to the National Film School. I was excited about the whole process of lighting and learning about it. I never had an opportunity to work on a film set, and I didn’t really know anybody who worked in film or television. I didn’t really have any understanding of how film sets worked, and it felt like such a hard world to find your feet in. That was in late ’90s, before you could go onto the Internet or Youtube and get some info about it, or get contact information. I remember going to the BBC in Manchester with a VHS showreel, and literally asking at reception “who I do I need to speak with to be a cameraman?! !”[laughs] It felt like a very closed and difficult world to get into. That is part of the reason why I moved to London and went to the film school. A lot of my skateboarding friends did the same, and they became runners or production assistants or production secretaries or whatever. Right after the film school I started shooting music videos, and online commercials – we all were helping each other. It was such a quick process of shooting one music video after another, and it led onto short films, dramas, and feature films. And that was my way of negotiating it in there [laughs]. Kirill: If you look back over all those years that have passed, how would you describe what happened in the world of technology around cameras? Stuart: When I started filming back when I was 13, we were shooting on massive VHS cameras, Hi8 or Digital8. My friends dad had a Digital8 camera, and our minds were blown! It was the most amazing thing. Then Sony VX1000 camera came out, and it became the staple of the skateboarding industry for the next 10-15 years. That was it, and that was all anybody knew. Kirill: Are you talking about the lights themselves, and how the most recent camera models capture the nuance of the light? Stuart: You can go back ten years or so when the RED camera came out, and that was a real game-changer for me. I was shooting a lot of music videos and online / low budget commercials at the time and, if you could afford it, you could shoot on 16mm or 35mm film, but other than that you were using dodgy adapters to stick a prime lens on something like a video camera. When RED came out, it was a very accessible and cheap way of getting the “35mm look” for a very low budget. The most exciting thing for me recently is advances in LED lighting. I was recently shooting a film and we had hundreds of sky panels in a studio all rigged up to an iPad. We could do chase sequences, switching between night and day in a push of the button. We could program it all right on that iPad, shooting a car sequence in a studio with LED panels. I find it incredible, and it gives the DP (director of photography) such a huge range of subtle and sophisticated tools to achieve the most fantastic images. Kirill: As you mentioned that things have plateaued a bit in the camera technology, as an outsider looking in, my impression is that the current advances seem to be focusing on adding even more Ks to the camera resolution – talking about 6K and 8K nowadays. Do you think that there’s a certain limit beyond which your eye doesn’t get anything new that is useful? Stuart: I’ve never been the kind of person that obsesses over the technicalities of pixel counting. I think that you can see an image that was shot on video with its own texture, quality and beauty. Just become something has a high resolution, to me it doesn’t correlate in any way to the quality or enjoyment of the image. There are certainly benefits to it though, if you’re doing something heavy in post-production that needs any kind of image manipulation, better resolution can help to qualify what you would call a “good image”. My approach to looking at cameras, be it 16mm or RED or Alexa, is to see them as tools for the job. Each job is unique. Each job has its own challenges and solutions. You have to pick the best tool for the job, and it’s as simple as that. They all have their own beauty and aesthetic, which you can embrace and manipulate. I don’t think I can say that one of them is better than the others, for me it just doesn’t work like that. Kirill: As you went through the path of doing music videos and commercials, to working on TV shows and feature films, do you remember anything that was particularly surprising on the bigger productions? Stuart: I’ve done a lot of short films, and that’s a good way to prepare for what a feature presents to you in terms of the pace and the challenges. It felt like a very natural progression to me. And the same goes for the music videos as well that generally have a very quick pace. When you get to a TV drama, you’re already used to that kind of pace and intensity. The first TV show that I did was period drama, and that was quite an interesting challenge. I’d not done shot period work before so it was a great opportunity to learn about shooting period drama and trying to deal with all the challenges that entails. Kirill: When you meet somebody new at a party, and you say that you’re a cinematographer, do you see that people have certain misconceptions about what your job involves? Stuart: A lot of my friends still don’t really know what it is that I do [laughs]. I say that I’m a cameraman, I try to keep it low-key. People that haven’t been on a film set might not know the mechanics of it. They don’t realize that everything is so finely considered. And in a way, why should they? They are wrapped up in the story, and they’re enjoying the film. You almost want them to be completely oblivious to that. I definitely have to explain to people that I do the lighting, and the camera, and that it’s all about telling the story, and working with the director. It’s such a collaborative process, and it’s all about the teamwork. As the DP, you’re there to support the director, and achieve that vision. Kirill: In the old days of shooting on film, everybody had to wait for the dailies to see the results of the previous day’s shoots. Only the cinematographer or the camera operator was able to “see” through the lens, and there was a certain dark magic involved in capturing the right image. And now there are digital monitors attached to the camera, and feeds going to multiple screens where a lot of people can see and comment on what is being captured. What are your thoughts on this? Stuart: There’s a balance on every production. A lot of the time, you are not necessarily seeking feedback on such a mass scale. Like I said, it’s a collaborative process, and you want people to be involved and engaged. But at the same time, you don’t want to be lighting or directing by committee. I find that happens a lot on commercials. People say that it’s too bright, or too dark, or not wide enough, and it is frustrating for both the DP and the director. It is directing by committee, and you feel that your work is being devalued in a way. But there’s a lot of people working on the set, like hair, make-up or costume, and it’s valuable for them to see things too. There’s something about the immediacy of digital that can really help film sets. But there’s also a negative side to having a thousand voices around the monitor that can detract from yours and the director’s vision. It’s a sensitive issue, and you need to manage it from day one, and set expectations. Some directors that I work with won’t allow monitors on set. Only them and the DP get the monitors. And then you work on a commercial, and you have 50 monitors. But the client is paying for it, and you have the agency that is putting months of work, and it’s a very specific vision. Of course, they should have a say on what they want. It’s a different process when you’re working on a commercial. It depends on the job, and the director, and the process that you want to employ. Kirill: Unlike “SS-GB” where you worked on all five episodes, you joined the first season of “Humans” to work on two episodes out of eight. If I’m looking at it from the perspective of the viewer, I wouldn’t necessarily want to see significant differences in how the story arc is told from episode to episode just because there were different creative voices involved. How do you find the balance between staying within the overall visual language of a show and bringing something of your own to it? Stuart: Like you say, it’s not about trying to make wholesale changes or putting your own stamp on it. It’s about being sensitive about what was shot previously, having a good dialog with the previous DP or director, and seeing what they thought works and what could be improved in specific locations. But also, by its nature, your own style and language come out. You can’t fight against your instincts – they’re why you have been employed so you have to work within the framework but also do you own thing to a certain extent. You get certain amount of consistency from the cast and the locations. The first episodes on Humans were more dollies and tracking, and if you look at the episodes that we did, we did a bit more hand-held. Then the next few episodes had more Steadicam, and they all have a slightly different look. But you have the consistent thread of the cast and the locations. Urszula Pontikos who was the first DP is a really good friend of mine and an amazing and talented DP – we talked about the challenges, the solutions, and what was the best thing to do to make the transition as seamless as possible. I also worked with the fantastic director Daniel Nettheim before, and that was great having a working relationship from previous shows. We stepped onto the set together, with common language and knowing how the other works. That was quite helpful for us. Kirill: Would you say that these shorted seasons and more focused story arcs also come with higher levels of expectation from how those stories are told on smaller screens? 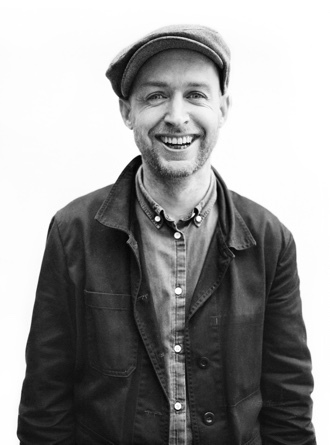 Stuart: I don’t know what the expectations would be, but I always approach every job, be it a commercial or a long-form drama, in exactly the same way. You want to hit the high standards, and produce the best possible work you can, regardless of the format or the scale of the production. I think that generally applies across the board. It’s a really exciting time, and there’s a lot of good drama with high production values that is being made. A lot of feature film directors are pushing into TV, and the line between film and TV is very blurred. It’s an exciting time. I like TV, because in a way it seems to be a more stable format. My experience with feature films is that things shift or change or the films just don’t happen at all or fall though for any number of reasons whereas TV generally has a schedule in place, and it is commissioned, greenlit. It always feels that films are very fragile to get off the ground, and there are so many elements at stake. The landscape can shift very quickly, especially around the financing, while TV feels a much more definitive proposition when it comes in. Kirill: How did “SS-GB” start for you? Stuart: When I got the script from my agent, I was abroad in Montenegro shooting a commercial. It was a quick read on my flight back to the Gatwick airport, and from there I went straight into the meeting. I didn’t feel at all ready for the meeting [laughs]. I normally go into these meetings after having done a lot of research and prep – getting references together and researching the period etc. I try to be very well prepared, and it didn’t feel like I was prepared for that meeting. I went in and met Philipp Kadelbach the director, and all the producers, and we got on really well. I had seen some of Philipp’s earlier work, and I was excited by the approach he wanted to take for the show. Then two days later I got a call saying that they wanted me to do it, so it was quite a straightforward process. Kirill: What kind of prep are we talking about on the scale of a roughly five-hour show? Stuart: Initially we sat down to read the script, talking broad strokes on the look and the locations. We talked about the art department, and what kinds of things we wanted to have within the frame. Philipp wanted to push as much texture into each frame as possible, and we talked about achieving that sort of noir atmosphere. Then we went on a really comprehensive round of initial recces, looking at the script to see what would work for the story. It’s a period drama, and sometimes you find something that only works 75% of the way. The exterior might be fantastic, but the interior does not work. You might look in one direction which will work for the period and yet when you turn around there’s a modern building behind you. You’re trying to put the pieces of the jigsaw together, finding alternate locations for those missing parts. You’re working with the first AD [assistant director], looking at the schedule to put that jigsaw together. 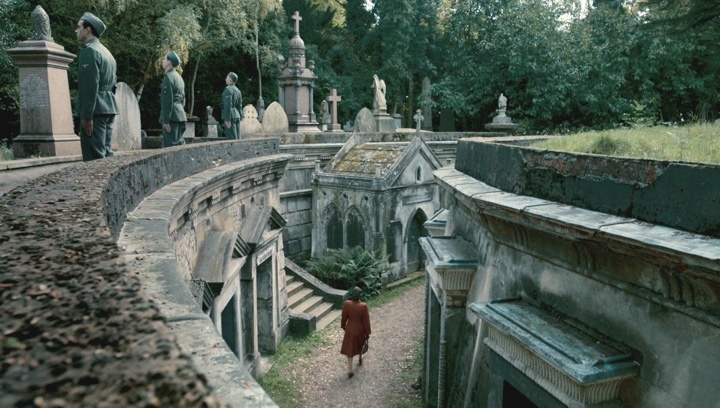 We spent weeks after weeks looking at the locations, walking things through, looking at different angles, where the characters would go, looking at the details of the blocking. You shoot in London, and you can pan 80 degrees, but if you pan anymore, you see a modern building or a modern road. We didn’t have a huge budget, so we couldn’t just throw visual effects [VFX] at it to get rid of it later. We had to be sensitive to what shots would be done in VFX to remove what needed to be removed. We were really specific about those shots. We employed all the tricks in the book. You’re shooting through the foreground to conceal things. You’re using a low camera, or a deep focus, or a shallow depth of field, or shooting at dusk – any number of techniques to conceal any problematic issues. We did the usual camera testing, wardrobe testing, grade testing and lens testing. It’s about being as thorough as possible. We were looking at stills and films. Kirill: The two world wars were a very traumatic experience, especially for Europe, and there have been numerous films and TV shows about those events. Do you think there is a certain established look to how these stories are told? Is it hard to find a unique take on such widely portrayed events? Stuart: There are obvious limitations. Take, for example, lighting fixtures. You can only use things or colors that are historically accurate, so you’re already bound by that in terms of the aesthetic. Generalizing a bit, there’s a tendency on period dramas towards the formal classical approach of having lots of tracking shots. We tried to take a slightly more modern approach, and to make the show immersive and raw. We wanted it to feel like you were living behind the main characters’ shoulders. It was all hand-held, and very immersive. Hopefully that worked, and that was the slightly different approach that we took compared to the usual period drama practices. We were using those historically accurate fixtures and fittings, but then trying to use a more contemporary approach in terms of the camera work. It’s two almost juxtaposing styles, and we were trying to make them work together. I think it made for quite a unique aesthetic, and it was something that I have not seen before. It was an interesting approach, and Philipp was keen to try and mash those two styles together. Having said that, we did do more elegant tracking shots. But I loved choreographing those long hand-held flowing takes. We put the broad strokes together during the recces, and then the cast came in and brought something new to the table. We were responding to that, seeing how that would drive the story. It was a really interesting challenge, with all the restrictions in certain locations, while letting the camera go as free as possible. Kirill: As far as the colors go, there’s obviously a lot of red from the Nazi flags, as well as vibrant costumes for Kate Bosworth’s character (Barbara). What was your intent around the color palette, because it certainly didn’t feel like a very drab place in general? Stuart: In terms of what could be considered ugly colors, you’re talking about lots of greens, browns, yellows and ochres. We wanted it to feel oppressive and harsh, so we had lots of those tones. But then also we had the cyans, steel blues and grays of the Nazis. Those cool colors of the wardrobe were cutting through the ochre palette of the architecture. 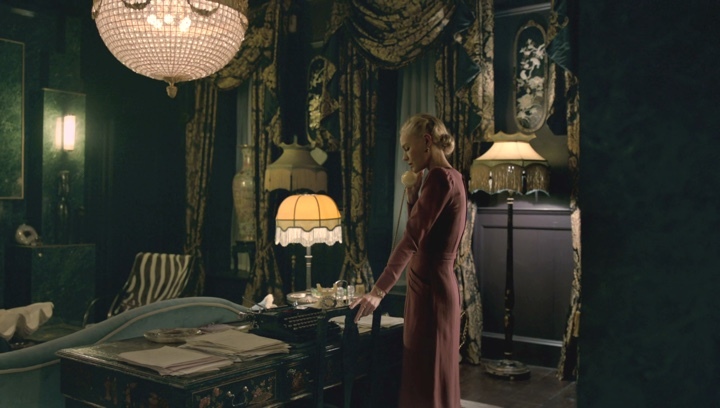 And then Kate Bosworth’s character was kind of a femme fatale, with softer pastel colors. 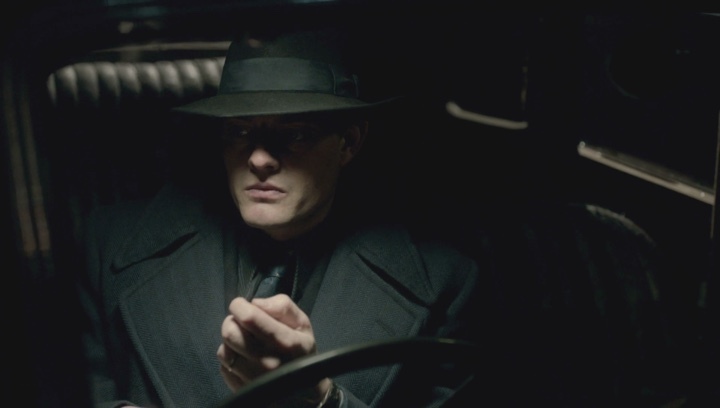 That was in contrast with the more angular, harsh wardrobe and palette used for the Germans and the British police. Those were dark grays and browns. We also went for a heavy, contrasty, strong and bold look with the grade. I think that helped add to that film noir style. Kirill: I remember the particular scene of the explosion in the middle of a ceremony, and there was a lot of stark contrast there, as well as sharp angles with the camera looking across and upwards or downwards. Those were very vivid images. Stuart: I loved playing with that. It has that espionage feel to it. You’re playing with eye lines. You’re shooting over someone’s shoulder when they are looking at somebody, and then you show that person looking back at them. We used a lot of foreground, trying to take the audience out of the scene. It’s slightly vouyeristic. It was an interesting contrast. On one hand, it’s very subjective and immersive way of living on the shoulder of that character. But then you also drop out of the scene, which adds a certain sense of a threat. You weren’t quite sure whether it was a point-of-view shot or of it was something else at play. We always wanted to underpin those scenes with a slight sense of threat. We used foreground, and tried to find frames within frames. A big thing that Philipp was trying to do was to shoot as much as possible in 360 degrees. We tried to light sets predominantly with practicals. It’s quite a challenge to do that on a period drama. You’re trying to establish this noir atmosphere, and to make it feel very controlled. You need to design the lighting quite specifically to get that atmosphere with hard shadows. But we were using a very fluid and mobile camera, and we couldn’t use traditional lights on set. So we were trying to establish and maintain the atmosphere using practical lights. We discussed this with the designer, looking at the blocking notes that we put together when we were on the recces. What would we need to put where when they are looking in a certain direction? Do we need a backlight? Do we need a light through that door when they are walking that way? It always about using practical lights. The initial recces and the blocking plans we made in prep were invaluable in helping decide where to put those lights. Kirill: As far as capturing those colors, how much of that was captured in camera, and how much happened in grading? Stuart: We didn’t have a lot of time, and it was quite a short grade. Asa Shoul is a fantastic colourist, and he did a lot of research to find fantastic photos of WWII that had been hand-tinted. We already had a really nice base of design, wardrobe and lighting to work from, and we enhanced and pushed that. A lot of it was captured in camera, and then enhanced and improved afterwards. It introduced contrast and saturation, as we were going for quite a bold look. I quite enjoyed that look. It’s nice to have something quite brave and contrasty, and not worry about losing detail in shadows or the corners of the frame. We almost had a license to push things. It was really satisfying. 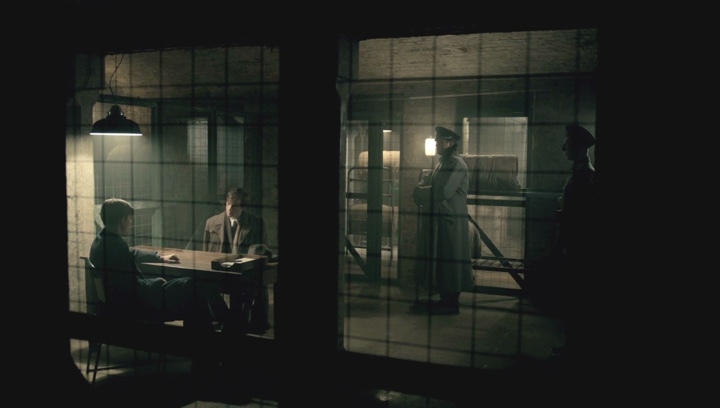 Kirill: There were quite a few recurring sets, from the apartment that Douglas shares, to the police station, to the general’s office and more. Even though it’s only five episodes, did you worry about doing too many repetitive angles as the story returns to the same set? Stuart: We were visiting a lot of those locations at different times of day. We could introduce variation with different lighting and framing to maintain a level of interest, so that you’re not always returning to the same shot. Barbara’s house was hugely challenging. It was on a third floor of a corner of that building. We could light it for day with big lights, but the schedule was tough. We were shooting during the winter, and we had a lot of very short days. We ended up doing a lot of night for day, and a lot of day for night. There was a lot of tenting and blacking out. We had to use flat blacks, and light the scene with practicals. We couldn’t light through the windows, because it was so high up. It was about being creative with where we could put up practicals. We were not allowed to drill into the walls, so we couldn’t hang anything from the ceiling. We were very restricted in terms of where we could put things, and it was difficult. At times, it’s the middle of the night in the story, and as somebody wakes up to go to the bathroom, they wouldn’t have any practicals on. The times were austere, they wouldn’t have any money to burn lights all night long or running electricity. Narratively, it became difficult to justify where our light sources would be. We couldn’t light through the windows because we had flat blacked them as we were doing day for night, we couldn’t do practicals, we couldn’t rig the ceiling, and yet we wanted to have a flowing space in which to shoot. There are always challenges in locations like that where you’re trying to figure out how to put lights into positions and get the desired effect. That’s where it comes back to what I was talking about with smaller fittings and LEDs. They are so small, lightweight and versatile. We can tape them onto the ceiling, or hide them in a corner, or use them in a way that you wouldn’t be able to do with traditional film lights. We might try and hide something behind a curtain to make it feel like a sodium street light or ambient light from the outside coming in. 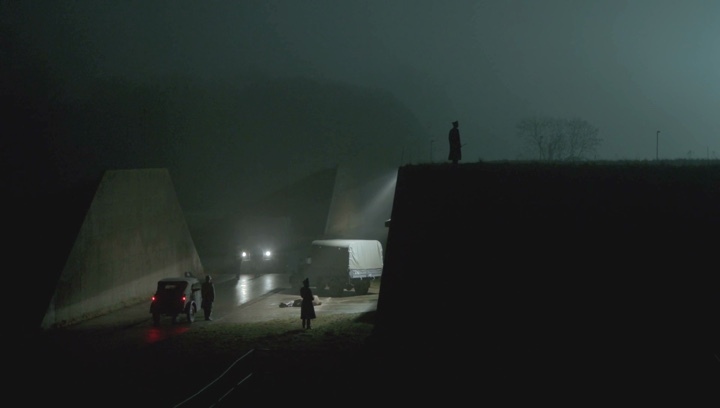 Kirill: As the story comes to the end in the last episode, a lot of it takes place during the night at some kind of an landing strip. Are the modern digital cameras good enough to work in those low-light conditions? Stuart: We recced that location multiple times. We had to be really specific about where our blocking was, as we had three specific places for the big lights and quite a serious lighting setup. We had to be very thorough about where we were going to shoot, because we knew all of the equipment footprint. It was a combination of recces and photos, looking at Google maps with the gaffer and plotting things. The prep was very thorough. We also had smaller units on the floor to enhance things like faces. But we lit the entire location with big lights, and used smaller sources to enhance close-ups. Shooting with that 360 degree style presents its own challenges. Those night sequences had tough schedules. We shot that one sequence in one night. The first AD Steve Robinson did an amazing job of planning and scheduling it. Sometimes you have to take a hit on lighting, and accept that certain shots wouldn’t be as pretty as we would want them to be. It was all in the interest of keeping the schedule, completing the day and allowing the camera to maintain that free-flowing style. We used car headlights, lights from little transistor radios or gas stoves, leaning on the art department to get as many practicals as we could to enhance what was already there. 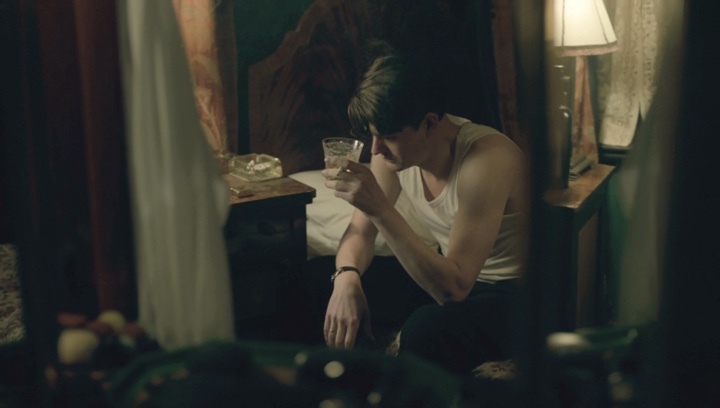 Kirill: There were a few intimate scenes between the two main characters in that apartment. As the director of photography, what do you do to minimize the disruption that the equipment and crew bring on the set in these particular scenes? Stuart: For me a huge part of DP’s job is to set the atmosphere and the tone on set. You want to be respectful of cast at all times, and if it’s a very challenging or intimate scene, people on the crew should respect that and behave accordingly. You want total silence. You want as few people on set as possible. You want to be fully prepped so that there are no surprises as they walk on set. You’re lit, you’re ready, you’re lined up. You’re good to go. There is no waiting around. They can come in, do their work and leave, and you’re not having to re-light things. You want to make sure that you’re totally focused and ready. I try to approach every scene like that. You want that level of preparation on everything, and not to have to re-light between shots. It’s about allowing the cast to feel comfortable and confident to work on set, and not feel self-aware or worried or concerned. I think it’s a really big responsibility for the DP to get everybody on board with that. It’s such a great and fun industry to work in, and I feel incredibly privileged to do so and I do love having fun on set but there have to be times where you have to be serious and conscientious of the atmosphere that you need to establish. For me it’s about striking that balance. Kirill: You mentioned that you had a bit of a budget for VFX. Are we talking about digital set extensions, or perhaps smaller things? Stuart: It was a combination of digital set extensions and clean-ups. We needed to paint out things like satellite dishes or cars that we couldn’t or were not allowed to remove on set. It’s a period genre, but then it’s also alternate reality. There was a certain license that could be taken, where we could create some things in that world. Although we had to be historically accurate, we had the license to push things. The art department made all the telephone boxes and the underground station yellow. They tried to de-brand London, which was a really interesting idea. The designer came up with the idea of what is happening in countries coming into occupation. The first thing that the occupying country does is to remove the identity. What I really liked about the story was the ambiguous moral compass of the show. It wasn’t that the Germans are bad and the British are good. It was ambiguous in the terms of which side do you sit on. Some of the things that the Germans are doing are quite good. And some of the things that the British are doing are not so good. I liked that level of complexity, and that was exciting for me when I was first reading the script. There is a lot of depth in the story and the characters. Kirill: After you’ve spent so much time working on the show, were you able to enjoy it when it was broadcast on TV? Stuart: You see it from shooting to editing to grading, and you see it so many times. Then you see it completed, and it’s a strange process. I find it hard to have an objective opinion on it, and just enjoy it for what it is. I love seeing it with the music, the grade and the VFX finished. There’s always a level of surprise when it’s all finished and is on the TV. It is such an exciting and rewarding part of the process. There are always shots and scenes where you are disappointed and feel that you could have done better. But you get that your whole career, and you always seek to improve on your next production. There’s so much about hitting a level of consistency, and you’re always going to look at your every film and think that there is room for improvement. I was very happy about “SS-GB”. I think that we created an interesting atmosphere. Looking back on it, there’s definitely stuff that we could improve on. There are certain scenes that we could have approached differently. But it’s tough as well on things like that. You’re on such a tight schedule. A lot of the time it’s just about making the day. It’s not about finessing some lighting or some camera move. You just have the responsibility to get through the day and to make sure that you get to the next one. It was a 66-day shoot, and you have to get through it. There’s a certain level of frustration when you are on that kind of schedule. Kirill: Does it get easier as you go from production to production, as you find certain ways to achieve specific things and you can fall back on those solutions that you’ve already found before? Stuart: You take your experience from one job to the next. 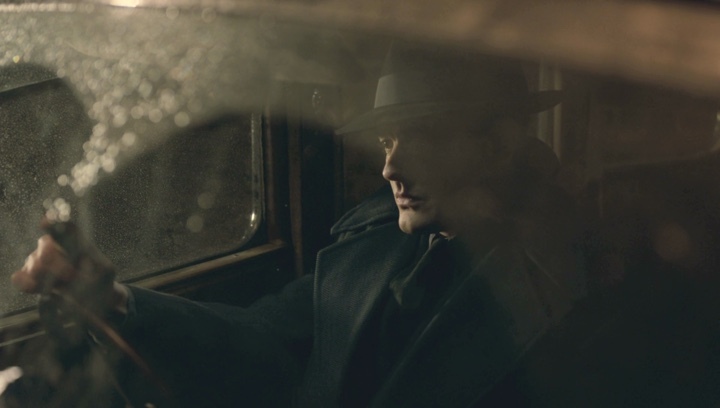 We did a lot of rear projection on “SS-GB”, and we also did a lot of it on the film that I’ve just finished. I already had that skill set. I already knew what worked and what didn’t work. You’re learning that way. 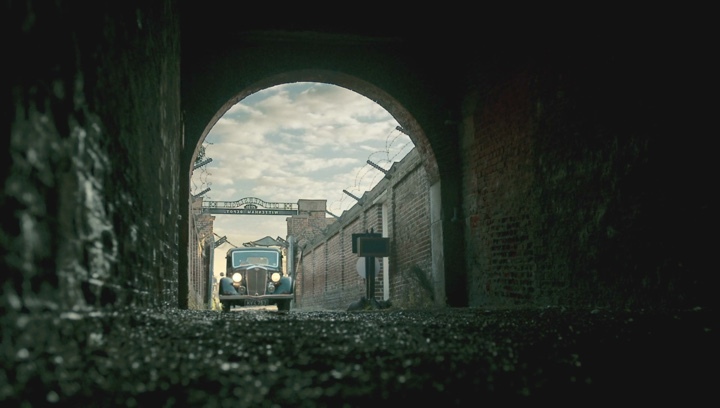 A lot of the things I learned on “Our World War” which was my first TV show were really beneficial in our approach to “SS-GB”. It depends on the scale of the production, but recently I find that a lot of shows that I worked on had really tight schedules. It’s frustrating for everybody – the cast, the director, the crew. The cast want time to do another take, the director wants time to do another take, I want time to put up another light, and you don’t have that. Like I said before, it’s about planning, prepping, and using your past experience to make sure that you’re getting through the day as efficiently and effectively as possible. There’s always going to be times when you feel that your work is compromised. You’re just trying to minimize it as much as you can, so you don’t have those sleepless nights when you’re worrying about the shot you did at the end of the day which was lit in a way that you were not happy with. You’re trying to make sure that you’re doing everything you can to protect yourself against that. Kirill: As the production winds down, and some time passes, what stays with you as you look back on those long days? Stuart: To me, it’s so much about being on set in the moment. It’s enjoying the feeling of being present. You always look back on things fondly. Each show is different. 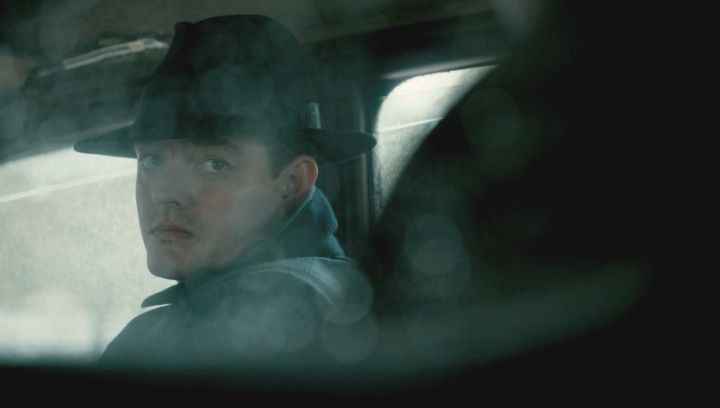 I look back at “SS-GB”, and I learned an awful lot. It was a challenging shoot. I learned a lot about all kinds of different aspects of cinematography. I came away from it feeling rewarded, as well as exhausted. It was all hand-held, and it was brutal – freezing cold and very physical – I was operating too so it was exhausting both physically and mentally (we also had James Swift on B-Camera who was amazing!!) Those were long days of shoot, and I came away feeling physically drained. But it was also rewarding, and I feel like I’ve learned a lot. I love the process of shooting. As soon as you’re on set, it’s the most exciting and fantastic thing. It’s such an amazing experience when you’re in that moment. I used to feel this way when I skateboarded when I was a kid. It’s almost like meditation. When you’re on set, all that matters is what’s happening there. I love that feeling. Kirill: Even though you might spend long stretches of time away from your family and friends. Stuart: It’s such a collaborative effort. To me, it’s about surrounding yourself with people whose company you enjoy. Can you be working with somebody for 60-70 days? If you have a good working relationship, and you have respect for them, and you enjoy spending that time, it’s a fantastic experience. That’s what keeps me going on the film set. It’s the people and the experiences. You get to travel and see amazing things. It’s such rewarding job for all its difficulties and for its challenges of being away from the family and friends. I wouldn’t change it for the world. It’s problem solving, and team work, and being present and in the moment. It’s that fantastic middle ground between technicality and art, that great balance between these two things. Kirill: Do you feel constrained by having to fit all the elements into a very strict rectangle of the frame? Stuart: I used to do a lot of photography, painting, sculpture and all sorts of other things at the college. One of the things I miss in film is that it’s so intangible. You can’t hold it. You can’t feel it. You can’t taste it. You watch it, and it’s gone. It has such a short lifespan. Those other things are so tactile, and you can see and feel them and look at them in your own time. That’s one of my few frustrations with film, and I don’t know what we can do to get around it. You watch a film once, and even though you might watch it again, it’s gone. It’s such a tiny lifespan, and you’re on to the next one, and the one after. And here I’d like to thank Stuart Bentley for graciously agreeing to answer a few questions I had on the art and craft of cinematography and on what went into creating the worlds of “SS-GB”. The mini-series is out now on BluRay and other physical and digital formats. Finally, if you want to know more about how films and TV shows are made, click here for additional in-depth interviews in this series. Stay tuned for more interviews in the near future!